TRIXIE CARE BRUSH WITH HAND-LOOP. Care Brush. with adjustable hand loop. 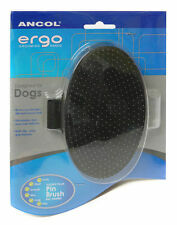 Ancol Ergo Dog Grooming Terrier Brush. Other grooming tools and accessories are also available from us. Particularly suitable for wiry terrier type coats. Brush your dog regularly to keep his coat in great condition and to help keep a check on his health. 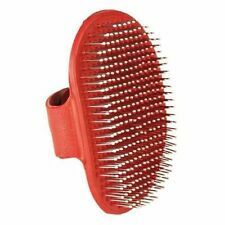 The Ancol Dog Flexible Pin Palm Brush is a handy dog grooming tool that feels natural and comfortable to use whilst being gentle on your dog's coat and skin. The adjustable strap affixes the brush to your palm allowing you to effortlessly groom your pet with a simple stroking action, ideal for dogs that are nervous about grooming. 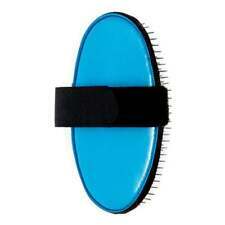 Approx Size: 8cm x 13cm (3" x 5") Rubber grooming brush. Care Brush. With adjustable hand loop. Stripping Knives For Terriers - Supplied in a storage roll up tie up wallet. 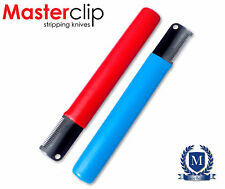 These ergonomically designed handle stripper knives fit comfortably in users hand. It is Paraben Free, Hypoallergenic and contains Organic active ingredients. Suitable for Fox Terriers, Scottish Terriers, Schnauzers, Cairn, Airedale, Irish Terrier, West Highland Terrier etc. and puppies. Groom Professional Terrier Palm Pad A flexible palm pad with stainless pins. Ideal for wired or curly coats. Discreet grooming tool that easily fits onto the hand Length: 13 cm. Ancol ergo Pin Pad Grooming Brush Removes tangles, dirt and loose hair Stimulates skin and hair follicles Anti slip strap Suitable for curly, short, smooth, wiry, long and silky coats . Groom Professional Pro-X No 7 Blade A range of blades which are top quality and yet are available at a price which means that any groomer can have a good stock of blades, meaning less down time caused by blunt blades. Pro-X blades undergo a special hardening process which provides excellent resistance to wear, whilst maintaining excellent cutting performance. 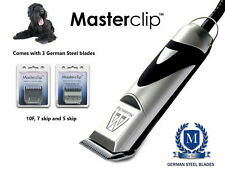 They come in both steel and ceramic versions and are compatible with all clippers which take snap-on blades. This blade will cut to 3 mm Ideal for most tight body work on terriers Skip Tooth Blade Although we have an extensive range of clipper blades, it should still be easy to work out what you need. Check out our handy table below for information on each blade size. Remember we are here to help, so if you are stuck on which blad. Mikki Palm Pad is a gentle grooming solution for the removal of dead and loose hairs from your dog's coat. The long stainless steel pins gently massage and invigorate the skin. The soft, flexible pad follows the body contours to give a close and thorough grooming and leave the coat clean and healthy. These professional rakes are excellent quality at a great price. Top quality. made from top quality steel. easy-grip, ergonomic handle. If there's a problem, just let us know and we will fix it. Suitable for breeds such as huskies, malamute, westies, cairn terrier etc. Ergo Palm Pin Brush. The Palm Brush With Strap Is Comfortable To Hold And Effective Due To. Terrier Harrow. • to remove resist, dirt and hair knots. • adjustable hand strap. When and with whom we send?. Hair Bows for Yorkshire Terrier and Maltese. NB the elastic bands on our bows are thick substantial bands - not cheap ones that snap easy. 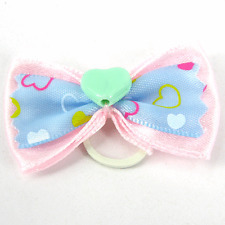 They are made of high quality ribbon in pink as shown above, with a center decoration. Hair Bows for Yorkshire Terrier and Maltese. NB the elastic bands on our bows are thick substantial bands - not cheap ones that snap easy. 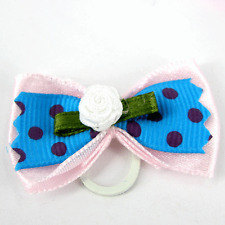 They are made of high quality ribbon in pink as shown above, with a center rosebud. (You can of course change the size and color of what you ordered in case they do not fit. see above, next to the photo ). • item(s) to be received including size and colour information. COLLECTION CANIAMICI Gill's SHAMPOO SCHNAUZER TERRIER 230 ml. Purebred Schnauzer Terrier dog, designed for. Instructions for use: wet the coat with warm water, apply shampoo and rub gently. Finally, rinse with warm water. Ideal for removing unwanted hairThe palm brush with strap is comfortable to holdEffective due to the flexibility of the padA great way to keep an eye on your pets healthUse the brush regularly to remove uncomfortable loose or dead hair, knots, tangles and other debrisThe Ergo pet brushes have been moulded with the ergonomic handle for both comfort and effective use. The packaging allows the consumer to hold and feel the product before making a purchase. These professional rakes are excellent quality at a great price. Top quality. made from top quality steel. easy-grip, ergonomic handle. Pet Type: Dog. Batteries Included: No. Batteries Required: No. Box Contains 1 x Groom Professional Terrier Palm Pad. Flexible palm pad. A flexible palm pad with stainless steel pins. Ideal for wire or curly coats. Length 13cm. Top quality. Key Benefits: Paraben Free Hypoallergenic active ingredients Suitable for Fox Terriers, Scottish Terriers, Schnauzers, Cairn, Airedale, Irish Terrier, West Highland Terrier etc. and puppies Directions for use: Apply to wet coat, gently rub then rinse thoroughly. A flexible palm pad with stainless steel pins. Ideal for wire or curly coats. Length 13cm Box Contains 1 x Groom Professional Terrier Palm Pad. Flexible palm pad. Top quality. Stainless steel pins. The Ancol Ergo Pin Palm Pad is a grooming tool that feels natural and comfortable to use while being gentle on your dog's coat and skin. The pins on the pad penetrate the coat to detangle the fur and remove loose fur. Trixie Care Brush With Hand Loop. With adjustable hand loop. Wipe clean. 100% Mixed. Quick view Conditioner Pure Paws TERRIER TOUCH with code: SB-PP0250 and EAN: 8410250000279. Storage and retrieval. Manufacturer:Pure Paws. Great conditioner to apply to beards and legs at exhibitions! Ergo Palm Pin Brush (Pack of 3). Ancol ergo Pin Pad Pflegepinsel Entfernt Verwicklungen, Schmutz und lose Haare Stimuliert die Haut und die Haarfollikel Anti-Rutsch-Gurt Geeignet für lockige, kurze, glatte, drahtige, lange und seidige Mäntel .